While the Korrigan, or Korrigans, were not necessarily Goddesses themselves, depending upon which myth and/or legend you believe, they were most definitely Her priestesses, and yes, The Korrigan, alone, may have been a Goddess. In France, Korrigan was the name of the Goddess of underground springs and wells. It was rumored that She was the grand-daughter of a great Druid Priestess. She was beautiful and She was radiant. Her powers were strongest at night, when she appeared as a Maiden. During the day, in her guise as the Crone, her powers waned. She was said to be not only beautiful, but dangerous; however, the danger was never toward women. Men who saw who were killed outright or forced to marry her and never return to their own lives. 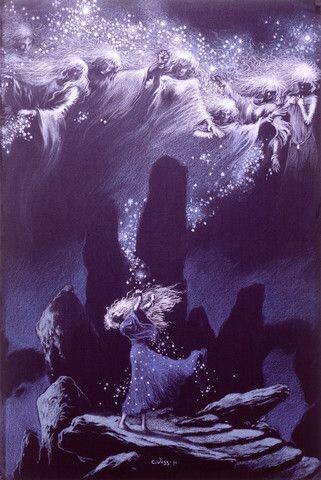 In other myths, the Korrigans were faeries or spirits. They may have possibly been water faeiries, haunting fountains and wells, where they would lure men to them, in the way of Sirens. This, ulitmately, would end in the death of the man. 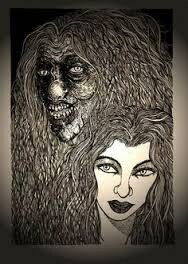 The Korrigans were thought to be the spirits of Priestesses who were angry at the rise of Christianity and fought it. Because of this, the new church portrayed them as demonic, as they did with so much of the old pagan traditions and deities. In turn, the Korrigans were do what they could to tempt and lure the priests. These priests would ring the church bells, as it was said that the Korrigans could not abide the sound. On the night of Samhain, they would lurk near dolmens, stone tombs, and waiting for a victim; they most likely were the ones who would switch a human infant with a changeling. The Korrigans would have their Spring Festival, where a goblet of inspiration and wisdom was passed from one to another. Apparently, any man who saw this ritual would instantly fall dead. However, not all stories of the Korrigan or Korrigans were dark and mischievous. One legend has it that there were nine of them, all healers, living in a sacred grove. They are described as being shape-shifters, which explains how they were sometimes seen as water faeries, goblins, beautiful young girls or wizened crones. 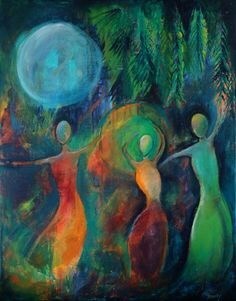 The nine would circle a fountain, dancing under the light of the full moon, as in ritual. Looking at the stories of them as Priestesses living in a sacred grove, and combine that with the fact that there is mention made of the Nine Korrigans of the Sacred Isle and the Nine Fays of Britain. This directly connects them to the Nine Sisters or Morgens of Avalon. If you look at their Spring Festival, it is easy to see that this goblet of inspiration and wisdom is actually the Holy Grail, the cup and womb of the Goddess. This would bear witness to how some of the old pagan stories were changed by the new religion of Christianity until there was almost nothing left of their origins, except in instances like this, where we can connect the one to the other and find their common beginning. Were the Korrigan(s) dark, evil and murderous? Or were they Goddesses, or at least, Priestesses of the Goddess? I’m going to go with the latter of the two. I believe their stories/myths/legends were changed to fit a new paradigm; a paradigm that would not tolerate a beautiful Goddess or Her Priestess that could shift their shapes, foretell the future and heal the sick.